Read Codes (a coded thesaurus of clinical terms for recording patient findings and procedures in health and social care IT systems across primary and secondary care, e.g. GP surgeries and reporting of pathology results). The National Information Board (NIB) has specified that all primary care systems adopt SNOMED CT by the end of December 2016 and that SNOMED CT is to be used as the single terminology in all health care settings in England, with a projected adoption date for the entire health system of April 2020 . This is an online browser and does not require any software to be downloaded. You will need to accept the license and then select for the UK “Local Extension” of SNOMED CT. Click on the “Search” tab to enter clinical terms. The SNOMED CT International Edition and “Local Extensions” for a number of other countries, including the US, are also available via the browser. All editions release new updates twice a year, on a staggered schedule. The Release schedule for the UK Extension is April and October. The Read Codes system of clinical terms has been used in the NHS since 1985. As part of the adoption of SNOMED CT in primary care, Clinical Terms Version 3 (CTV3) is being deprecated. There was no new release for CTV3 issued in October, but the April 2016 release is scheduled for Friday, 18th March 2016. The last release of CTV3 will be published in April 2018. 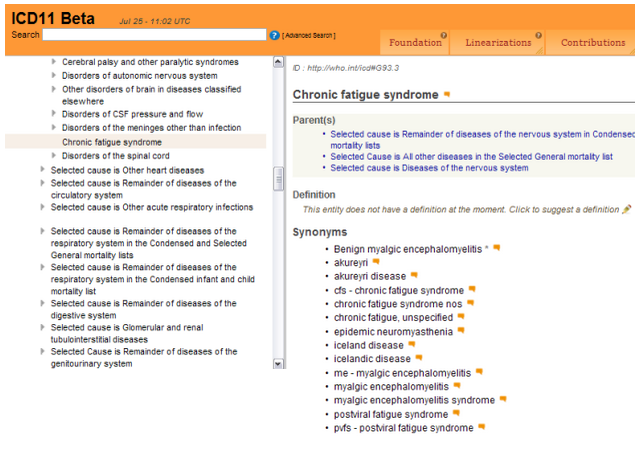 How have CFS and related terms been listed within SNOMED CT and CTV3? 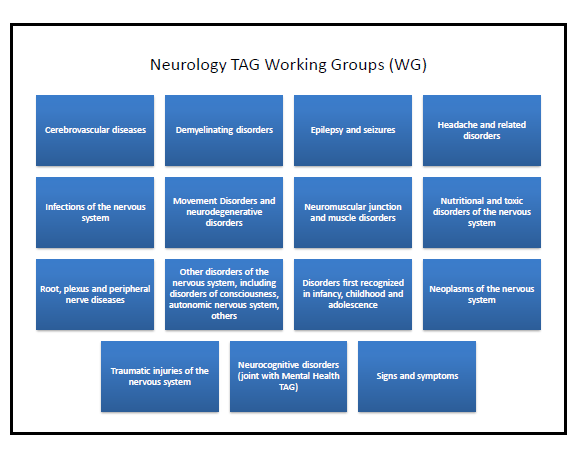 Chronic fatigue syndrome (with ME – Myalgic encephalomyelitis and several other related and historical terms listed under Synonyms) was assigned two parent disorder classes: Mental disorder, and Multisystem disorder. 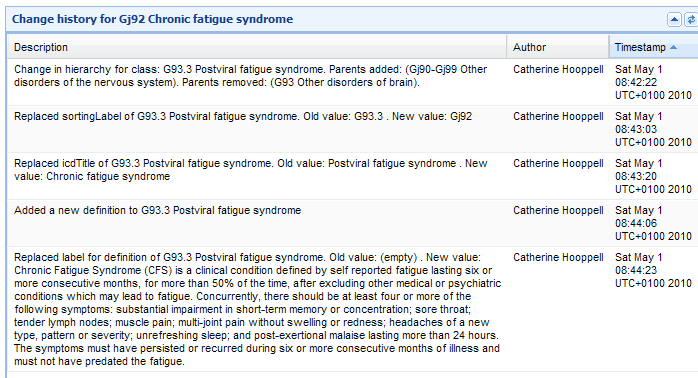 Postviral fatigue syndrome was listed under Children to Chronic fatigue syndrome. For CTV3, Xa01F Chronic fatigue syndrome (with ME – Myalgic encephalomyelitis and PVFS – Postviral fatigue syndrome under Synonyms) is listed, hierarchically, under two parent disorder classes: as a Sub Class of both Neurasthenia, under parent: Mental health disorder, and as a Sub Class of Neurological disorder. Forward-ME is an informal group for ME charities and voluntary organizations, chaired by the Countess of Mar, who also serves as Co-chair to the All-Party Parliamentary Group on Myalgic Encephalomyelitis (ME). Between November 2014 and June 2015, Lady Mar was in correspondence with Mr Leon Liburd, Senior Support Analyst Systems and Service Delivery, and Ms Elaine Wooler, Advanced Clinical Terminology Specialist, UK Health and Social Care Information Centre. As a result of these exchanges, Lady Mar was advised that the relationship between the entry for 52702003 Chronic fatigue syndrome and the Mental disorder parent had been retired. In future editions, Chronic fatigue syndrome would be listed under the single parent, 281867008 Multisystem disorder. Additionally, 51771007 Postviral fatigue syndrome was being removed as a subtype of 52702003 Chronic fatigue syndrome (disorder) – though no rationale for this specific decision appears to be provided within the correspondence. These changes were effected in the July 2015 release for the International Edition (Release 20150731). They were subsequently incorporated into the September 2015 US Extension (Release 20150901), the October 2015 UK Extension (Release 20151001) and the November 2015 Swedish Extension (Release 20151130). It is expected that other country Extensions will also reflect these changes in their forthcoming releases. In November, I contacted the UK Health and Social Care Information Centre for clarification of how CFS and its various Synonyms are currently listed within CTV3. and that this change should be reflected in the April 2016 CTV3 release. As noted above, Clinical Terms Version 3 (CTV3) is being deprecated and the last release of CTV3 will be published in April 2018. 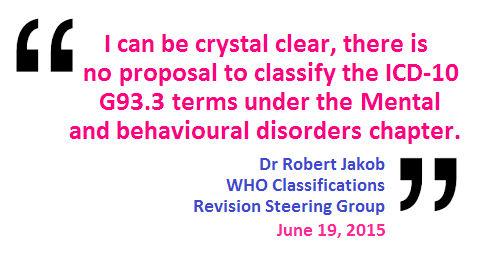 In June, WHO’s Dr Robert Jakob had told me that if TAG Neurology’s proposals and rationales for the G93.3 legacy terms were not ready for public release in September, he projected their release by December, latest (see towards end of Post #324). No proposals were released in September and none in December. 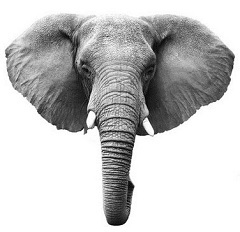 Eight years into the revision process and stakeholders still don’t know how ICD Revision proposes to classify the ICD-10 G93.3 legacy terms for ICD-11. On 28 December, I called again, via the ICD-11 Beta Comments mechanism, for these terms to be restored to the public version of the Beta drafting platform.